Just wanted to say howdy to some fellow Bengal fans and say how happy I am to find a board thats not full of Browns and Ravens smacktalkers! I've been a Bengals fan for 29 years and man o' man is it great to see the energy and excitement this team is bringing to our hometown! Anywho I look forward to getting to know some of my fellow fanatics and having a good time here. Welcome. 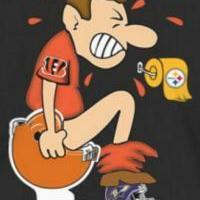 Can always use another Bengals fan. Stop by often and have fun! Hi Jungle - welcome aboard. You'll find a couple of Ravens fans pop up here quite regularly, giving as good as they get, but they're OK guys, despite their misguided support of their football team. I'm sure you'll enjoy the informative and passionate debates that rage on here - many different points and many different characters. It's good that you're with us, I'm sure you'll enjoy being here. Hey ScottishBengal... Did you listen to the whole game? make it up ok for work? Bummer with the time difference. Great game though. Makes it much easier when we win. I'm affraid I "woosed out" on this one - time difference would have been a real slayer for me. Got up and checked out the scores first thing in the morning - putting my underwear on in a jovial mood because of the win. putting my underwear on in a jovial mood because of the win. Welcome Jungle! This ia a great place! Have fun! OK JB... Who's the beauty in the Avatar! Make sure you continue to express your opinion whether it's popular or not; it will still be respected as long as you respect the members and friends already here. I go to a number of boards but IMO this is the Best Bengals Board to post on.